Last week I was teaching one of my amazing adult clinics. 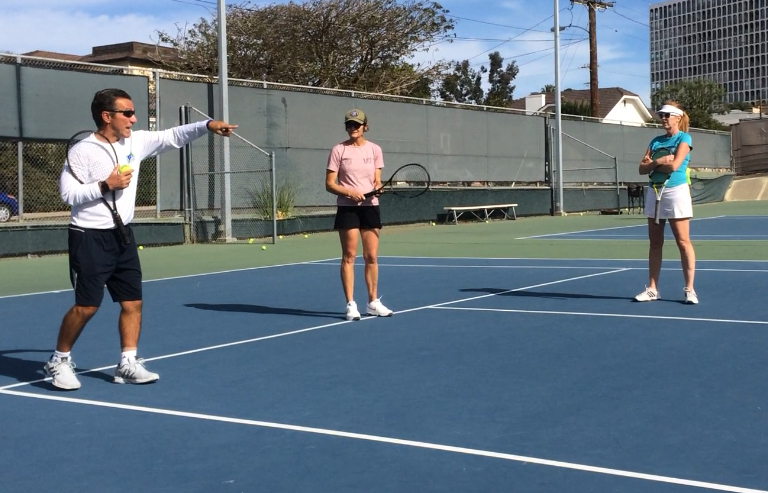 A group of players (like all my clinics) that love tennis, are willing students, always learn (because they’re not afraid to try something new) and understand that by supporting each other, they will force each other to keep improving. It’s a coach’s dream! We were working on serve and volley vs. return and volley. The receivers were always trying to put the server in “jail” ( if you don’t know what that is, you’ll learn it in The Previdi System). The servers were trying to figure out how to neutralize the return and gain the advantage themselves. We had a ton of amazing, competitive points but there was one player who consistently won points whether she had the advantage or not, no matter how hard the opponents tried. As I said, everyone played well, but some of the players got to the point that they conceded that they had to play so much better against her just to get an occasional point. 1.) They never panic or get tight regardless of how bad things might look. 2.) They are great at reading situations and understanding what their next move should be. 3.) They are decisive. They don’t hesitate of vacillate. 4.) They know they can’t win every point but as long as they make their opponents earn every point they understand that they will be fine in the long term. 5.) They run their plays. They don’t get away from what they’re good at and what they’ve practiced. They trust the process. If this player sounds like a winner to you, there’s good news. You can be like them too. All you have to do is practice and get great at the first two shots of every point, learn to relax when you play and take your time so you can assess all situations. In The Previdi System, we teach you how to handle situations, not just how to hit shots. You’ll learn when to slow things down and when to speed them up. When to use angles and when to use the middle. Over time, the game will just flow out of you in an effortless way, the way music flows out of a great musician. You will be the game and the game will be you. It’s the ideal state for a tennis player and all you need to do to achieve it is practice, play matches and relax. Don’t try to win and don’t try not to lose. Only focus on the point you’re playing because it’s the only one you can ever win. At this point you’re probably wondering why most tennis players are the opposite of what we’re talking about here. We’ll have those answers, plus more tips in upcoming articles.